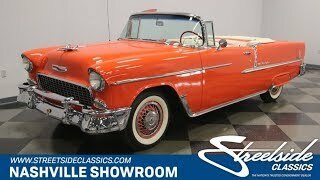 Hi, I am interested in your 1955 Chevrolet Bel Air (stock #1248-NSH) listed on Autotrader for $66,995. I'd like to get more information about this vehicle and confirm its availability. There is something special about a car that has been restored from the frame up in all its stock, original glory. The craftsmanship and attention to detail was so outstanding on this car that it won an award from the Antique Automobile Club of America, which is dedicated to the preservation and enjoyment of automotive history. Now its up to you to make sure the enjoyment part of their mission is realized. Come on down and check out this sweet ride! Presented in Gypsy Red, this car looks fantastic! You can rest assured that there was plenty of time spent preparing the body panels so that they were spotlessly smooth and lined up perfectly before a drop of that gorgeous paint was applied. The 55 Bel Air has crisp, clean lines that look good all by themselves, and when you add chrome spears on both the front and rear, and dress out the rocker panels with chrome, you can see why they have become one of the most sought-after classics ever made. The front of the car leads with lots of chrome too. A bold hood ornament is perched over an egg-crate grill with a substantial double bar bumper sporting its National First Prize badge underlining it all. The icing on this cake is the convertible roof. It looks good when it is up, but when it is down, the look will take your breath away and cause people to strain their necks checking you out as you drive by. Open the door and you will find a meticulously restored interior in Red and Beige. The door panel has a beige vinyl panel that holds the chrome power window switches, door handle and vent window crank. The armrest sits in a red panel with horizontal pleats and beige trims out the bottom. The split bench seat is power operated and has pleated red seating surfaces with beige dressing out the top and sides. A three-spoke steering wheel is a work of art in red with a full circle chromed horn ring and a blue and gold badge in the red center. Behind it is the column shifter for the manual transmission and a symmetrical double hump dashboard. The driver gets the speedometer with the fuel and temp gauges of course, while controls and the AM radio are set into the chrome panel that runs across the center, and the passenger gets Bel Air in gold along with a clock in their dash pod. Red carpeting with red vinyl floormats finish the look off nicely. Open the hood and you will find a fully restored and completely stock 265 cubic inch V8 nestled down in a meticulously detailed out engine bay. This engine was first offered in the 55 models and this one is believed to be the original one that the car was delivered with. It was groundbreaking at the time with its overhead valve, high compression, short stroke design. A glossy black air filter tops the motor with the proper Chevy Orange coating all the engine iron. Chevrolet lettering on the valve covers is highlighted in black and all the belts and hoses as well as the generator and power steering pump are new. Power flows back through a 3-speed manual transmission to the rear wheels mounted on leaf springs. This was a frame off restoration so everything on the chassis has been properly and meticulously cleaned, painted, repaired or replaced as part of the process. The rubber meets the road through 6.70-15 wide white wall tires mounted on steel wheels with wire wheel covers. This is a very special car. It is automotive history properly restored and preserved for the enjoyment of its next owner. Will that be you? Come on down and check it out. We think you will be impressed.